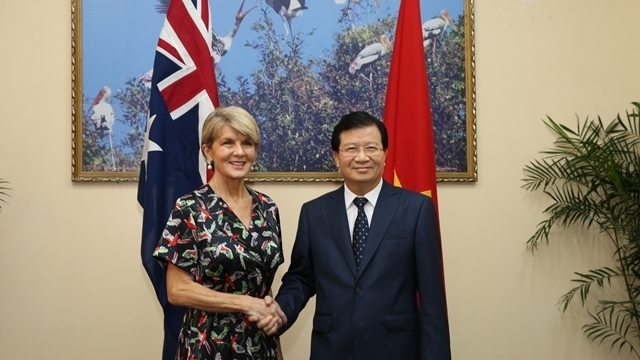 The Australian Government considers Vietnam one of its key partners in the Asia-Pacific region, Minister of Foreign Affairs Julie Bishop has said. 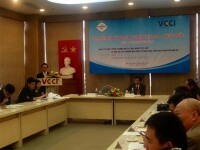 The diplomat made the remark at her meeting with Deputy Prime Minister Trinh Dinh Dung on May 27 before attending a ceremony to inaugurate the Cao Lanh Bridge in the southern province of Dong Thap. She spoke highly of Vietnam’s achievements in promoting socio-economic development, expanding foreign relations and boosting international integration. 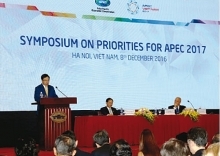 She emphasised the importance of the upgrading of bilateral ties to a Strategic Partnership, affirming that Australia will closely work with Vietnam to realize the contents agreed in the “Joint Statement on the Establishment of the Vietnam-Australia Strategic Partnership” and fulfill objectives set in the Vietnam-Australia Plan of Action 2016-2019. Deputy PM Dung suggested the Foreign Ministries of the two nations hasten relevant ministries and agencies to implement cooperation plans to develop the newly established Strategic Partnership strongly and effectively in the coming time. He applauded the ministries’ plan to organize the first ministerial-level meeting on the occasion, which will kick off a series of newly-formed cooperation mechanisms and frameworks between the two countries. He also valued Australia continuing to give official development assistance (ODA) priority to Vietnam in the 2018-2019 fiscal year, confirming that Australia’s ODA will be used effectively and practically for the country’s socio-economic development. He proposed Australia continue assisting Vietnam in the fields of infrastructure, agricultural and rural development, climate change adaptation, and human resources development. She reiterated her country’s support for Vietnam in its bid to become a non-permanent member of the UN Security Council for 2020-2021, saying that Australia is willing to share its experience in assuming this position for the 2013-2014 tenure. Deputy PM Dung informed his guest that Prime Minister Nguyen Xuan Phuc sent an invitation to his Australian counterpart Malcolm Turnbull to visit Vietnam and attend the World Economic Forum on ASEAN in September this year. He added that Vietnam attaches importance to this meeting and wishes to welcome the Australian PM at the event.